Appearance: Pine martens are like the ones in our world, but bipedal and clothed. Diet: Meat; occasionally breads and vegetables and fruits and such. Typical Personality: The personality of pine martens is really unknown; there have been only a couple pine martens in the Redwall books. Most likely pine martens are one of the more intelligent species, fairly crafty, and of course like all vermin, power-hungry. Appearance: Pine martens look much like weasels or ferrets with their long body. They are generally a dark brown with a lighter brown or yellow throat patch and a long, fluffy tail. Males are 51-54cm long with a 26-27cm long tail and weigh 1.5-2.2kg. Females are 46-54cm long with a 18-24cm long tail and weigh 0.9-1.5kg. Life Span: Most martens in the wild live to be less than eight years old, but have lived up to 15 years in captivity. Diet: Martens eat small rodents, birds, beetles, carrion, eggs, berries, and fungi. They mostly hunt on the ground but are also great climbers and often go after squirrels in the trees. Habitat: Female martens have territory ranges of about 5-15 square kilometers, while male territories are 10-25 square kilometers. They prefer dense woods and make their dens in hollow trees, fallen root masses, cairns, and scrub-covered cliffs. They are very solitary. Typical Personality: Martens are only semi-territorial. While a male's territory may overlap a female's, a male's territory does not overlap another male's, and a female's territory doesn't overlap another female's. Sometimes, if a female's den is where her territory overlaps her mate's, the male will protect the den. Otherwise, the female rears her young on her own. 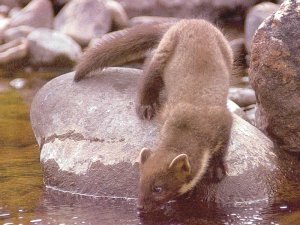 Habits: Pine martens are nocturnal, mostly coming out at night and at dusk. Life Cycle: The female has a litter each early spring of 1 - 5 young. After six weeks, the pups are weaned, and they leave their mother's territory at 12 - 15 weeks of age.